Dr. Erianne A. Weight is an Associate Professor of Sport Administration. Her research is directed by a vision to increase opportunities for athletic participation and education. This effort has thus far been focused on examining the financial, educational, and administrative impacts and opportunities for growth within intercollegiate athletics. She is currently the director of the Center for Research in Intercollegiate Athletics and a research consultant for Collegiate Sports Associates. 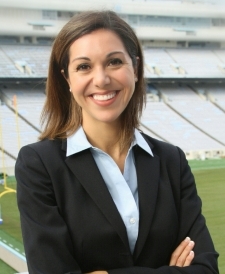 She also currently serves as the Managing Editor of the Journal of Applied Sport Management and recently completed service on the UNC faculty executive board. She earned her Ph.D. in Sport Marketing and Management from Indiana University, and her Master of Business Administration and Bachelors degree in Exercise and Sport Science from the University of Utah where she also competed as a heptathlete and served as a graduate assistant coach. The courses she loves to teach include intercollegiate athletic administration, strategic management, sport finance, and research methods. She is married to Matt Weight, a model, corporate recruiter, commercial pilot and former University of Illinois wrestler and has two daughters – Aleah & Lillian. She enjoys spending time with her family and participating in just about any type of athletic endeavor. The future of the student-athlete experience presented for the National Association of Collegiate Directors of Athletics (NACDA) conference (May, 2017).